Evolve or die. That’s the motto at the HK Metalcraft Manufacturing Corporation on Industrial Road in Lodi, NJ. 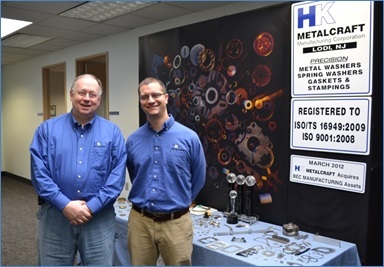 Bob MacPhee, left, and HK Metalcraft President Josh Hopp, stand next to the company’s product-display table at the Lodi, NJ plant. The latest evolution at the company, which makes precision metal stampings such as folded metal gaskets, spacers, shims, washers and custom parts, is something called “process control,” a complex production discipline that seeks to raise quality and lower costs through continuous improvement to work flow and production processes. “We operate on very tight profit margins. We have to be more efficient,” says Hopp. The initial challenge for HK Metalcraft was finding the right person to fill the new position of process control engineer. Thanks to Ready to Work New Jersey, the company has found the right man for the job. His name is Bob MacPhee, and he’s got a personality as big as his contagious grin. MacPhee, an industrial engineer by training and experience, was determined to get back into his line of work after being tumbled in and out of companies through successive recessions, each one taking him further away from manufacturing. He was both unemployed and underemployed. This made MacPhee, who lives in Midland Park, the perfect candidate for Ready to Work New Jersey, a federally funded program initiated and run by the NJ Community College Consortium for Workforce & Economic Development, the state’s largest workforce training organization. Ready to Work is designed to solve two related problems: 1) the difficulty employers face in hiring high-skill workers, and 2) the difficulty unemployed or underemployed individuals have in finding employers who need their skills. “Ready to Work matches job seekers with participating employers to close the skills and employment gap; that is what it’s all about,” says Sivaraman Anbarasan, CEO and Executive Director of the NJ Community College Consortium. The program targets individuals who have been out of work for six months or longer, are underemployed or some combination of both. With his more than 25-year background and skills in industrial engineering, computers, work flow, and process controls in the manufacturing, insurance, retail and consulting industries—not to mention a Six Sigma Green Belt and his winning personality— MacPhee was quickly matched with HK Metalcraft by Ready to Work NJ. Ready to Work NJ will reimburse HK Metalcraft up to $10,000 of MacPhee’s wages during his initial period of on-the-job training and cover the cost of any additional outside training if this is required as a condition of employment. This story was originally published in the July 2015 issue of New Jersey Business, the magazine of the New Jersey Business & Industry Association. The author is Christopher Biddle, President of Biddle Communications & Public Relations.